Elizabeth Castro just published a new book about EPUB production, with the title From InDesign CS 5.5 to EPUB and Kindle. She asked me to create an illustration for the cover. This is just one more book in a series of miniguides about the same topic, so I decided to continue with the same general theme as I used in the first cover illustration I created for this series. 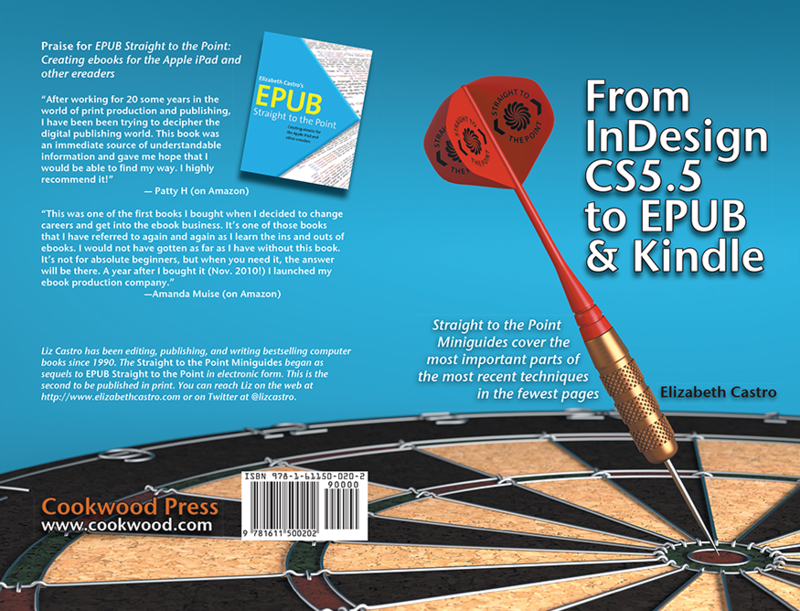 I wanted to maintain the diagonal element on the front cover, and leave the back cover relatively empty. Also, I wanted to keep some sort of horizontal divider. Other than that, I knew I had to use some image that made some reference to the word point, since these minguides are all expansions of the original Straight to the Point book. That's where the dart idea came in. This is the final render. gave me the final size, approximately 3500 x 2700 pixels. This is the final cover design (not done by me). 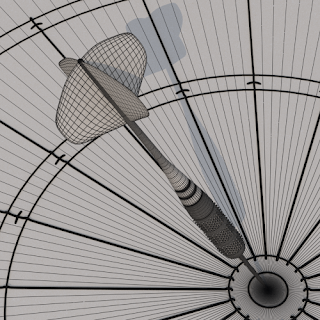 All the models in the image were created in Blender from reference images of darts and dartboards. 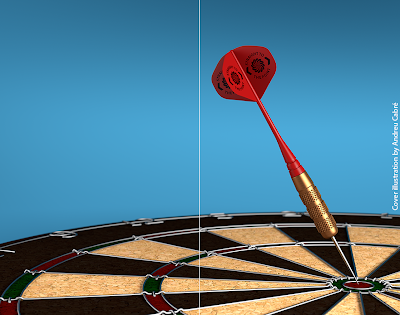 The final render was done in Cycles, the new render engine recently incorporated into Blender. What's great about Cycles is that it allows for real-time render previews, which takes away a lot of the guessing related to lighting. Another great thing is that it's a physically correct renderer, which means that you can achieve realistic-looking results with less fidgeting than with Blender's original render engine (Blender Internal). Also, it does depth of field beautifully, and although it is physically-correct, it still lets you cheat your way out of any problem. Unfortunately, at the time I'm writing this, it still does not support compositing, otherwise I would have added some motion blur. Actually, I could have added it in Photoshop, but we decided against it because we wanted something simpler—it's a book cover, not a video game! Here is a clay render of the models' wires. 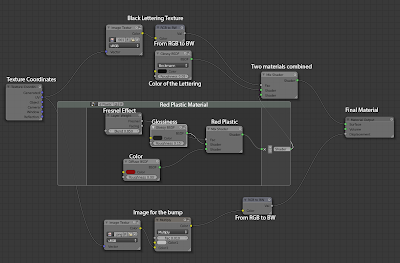 Many of the original materials are relatively complex, and involve mixing two or more layers (‘nodes’ in Cycles parlance) to achieve a certain effect. What's neat is that you can save node groups to be reused later on, even across files, which is a real time saver. 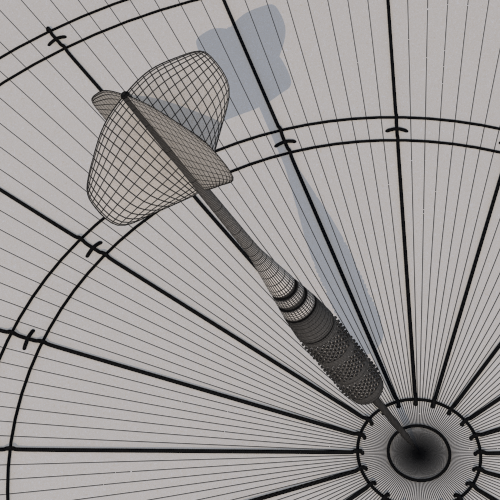 I am attaching a screenshot of the node setup for the red plastic with black lettering on the dart fletching. Roughly, the red plastic finish is achieved by combining a Glossy and a Matte material, but the mix is controlled by a Fresnel node, which determines the intensity of an effect depending on the view angle of the camera. The lettering texture defines what is red plastic and what is black—just like an alpha channel in Photoshop. I Started Selling Models on Turbosquid!